These form the "foundation" that a band's music is built on, and give the band that wonderful deep "presence" that completes the overall sound. Again, different composers use them in different ways within the band. They rarely get solos, unless the piece being played is actually a tuba feature. They are broken into two sections, the Eb and Bb bass. We are nearly at the bottom of the band here, but not quite - that is reserved for the Bb bass. 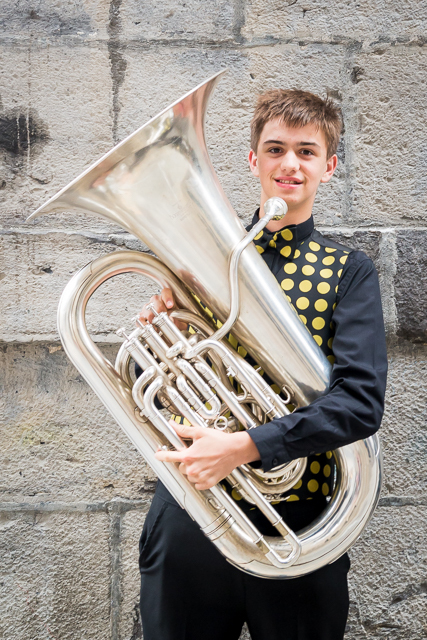 Although "baby tubas" are available, the full size versions are seriously big instruments! As the name suggests, this bass plays in the key of Eb, and is usually accompanied by its bigger, and lower brother, the Bb bass. Youth Brass 2000 currently has three Eb basses. To give you an idea what an Eb tuba can sound like - do you remember that wonderful film "Close Encounters"? When the huge mother ship replies to the notes being played to it, those two massive notes that make everyone jump out of their seats are played on an Eb tuba! 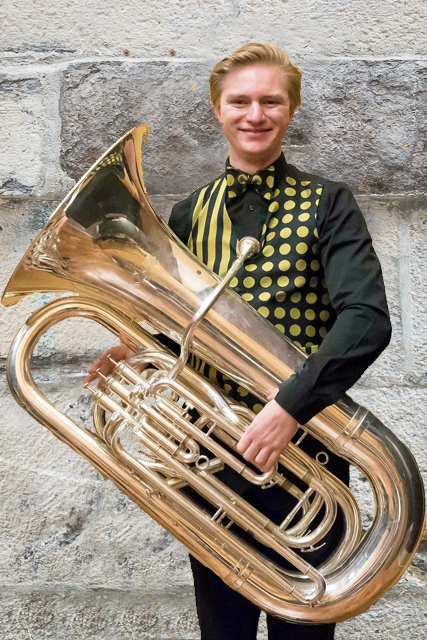 The Eb tuba is another instrument that is used in orchestras and other types of band. This is as big as they get! Again, there are "baby" versions available, but the full size Bb bass is not the instrument to play if you live at the top of a block of flats, or your transport is a mini! It produces a very deep resonant sound. Very rarely used on its own as a solo instrument, along with the Eb bass, these machines do the same sort of job as the double bass in an orchestra, or the bass guitar in a jazz band. There are currently two Bb basses in Youth Brass 2000. Bb tubas are almost never seen outside a brass band.